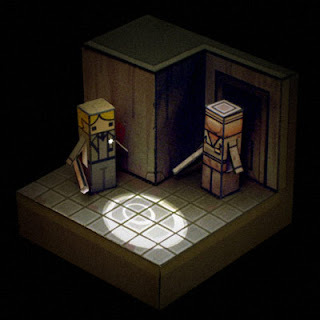 Here's a pretty simple hako-style papercraft from the konami game Silent Hill 2. There's a new macross jet at sascha's site. Check out the Macross VF-4 1/48 Super Scale papercraft along with many of his other models. These 4 awesome papertoys been posted for quite some time now but I've only seem 'em today. Johnny Chiba's 4 element of hip hop paper toys-Graffiti, Emcee (not rapper), Deejay & Bboy. Go get 'em guys! Here's a really nice Christmas papercaft for you guys. To download, click on the link under the word "TOP." Download your favorite character from the 2006 animated movie Cars including Mack, Sarge, Luigi, Lightning's Trailer, Fillmore, Doc Hudson, The King, Red, Guido, Mater and Sheriff. 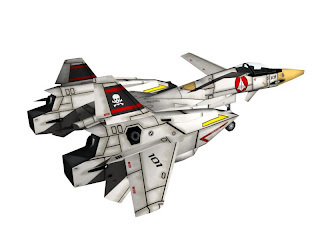 New paper models from the Warhawk playstation site. Some of you might have been intimidated to build their first model(Eucadian Ultra Realistic) due to the numerous pages(37) of parts included. Worry no more as they have come up with a much simpler version with only 9 pages of parts. You can also get the Chernovan Nemesis airplane. 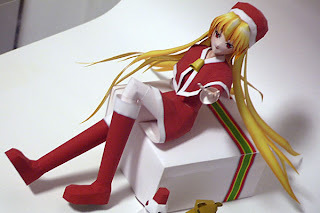 Christmas is just around the corner and some of you might want to build some Xmas models. Here are some paper automatas made by Keisuke Saka. Turn the wheel and watch your creation move. 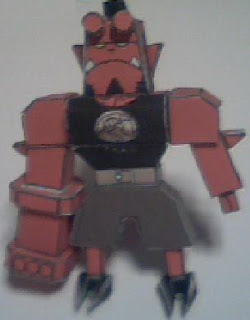 Here's a pretty simple papercraft of Hellboy- the fictional Dark Horse Comics character. Just to let you know, Bazookajo is also designing a highly detailed Hellboy bust model. Now that is something to look forward to. 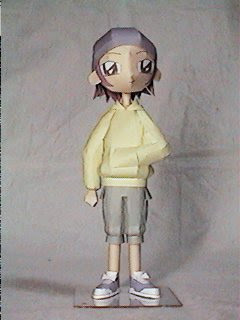 Here's a link to an old site of an anime boy papercraft. To download, click the dabo100.lzh link(3.93 mb). 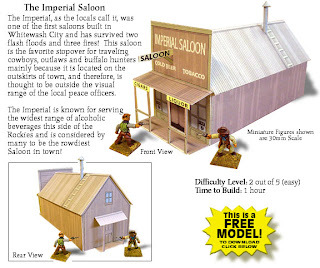 This is a FREE PDF MODEL SAMPLE of Whitewash City's "Imperial Saloon". This model is based on a saloon found in Dodge City. The Imperial Saloon is a fairly common building style, that was quick and inexpensive to construct and was found in virtually all Wild West communities throughout the USA and Canada. Today is a special day ‘cause it’s Papercraft Paradise’s first anniversary. I wanted to make an awesome paper model for you guys but designing one is not an easy thing to do. 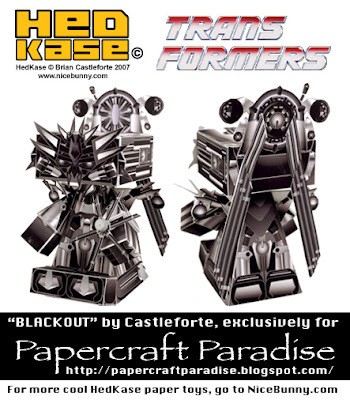 Instead, I asked Brian Castleforte to make us an exclusive model and he came up with one of his best looking Hedkase papertoys yet. I hope you guys will like it. Just click on the thumbnail to download. Don’t forget to visit nicebunny.com for more Hedkase papertoys.